Spanning 18 acres in central Brooklyn, Cypress Hills National Cemetery is the only national cemetery located in New York City. Cypress Hills was one of the first 14 national cemeteries established in 1862. Not only is the cemetery the final resting place for Union and Confederate troops, burials also include veterans of the Revolutionary War, War of 1812, Spanish-American War, and the Korean and Vietnam Wars. Although New York City was not a part of the Civil War conflict zone, there was a need for burial space for the soldiers who died in the area’s military hospitals. The Federal Government established a soldiers’ lot in the private Cypress Hills Cemetery in April 1862. This small 2.7-acre plot is known today as the “Union Grounds.” In 1884, the Federal Government purchased a larger 15–acre parcel of land adjacent to the private cemetery, dedicating it as the Cypress Hills National Cemetery. In 1941, the state of New York transferred the 0.6-acre “Mount of Victory” plot within the private cemetery to the Federal Government. Cypress Hill National Cemetery and the associated lots in the private cemetery are closed to new interments. Together, they contain more than 21,000 graves. Nearly 500 Confederate soldiers are also laid to rest in the cemetery. These soldiers died as prisoners of war in one of the seven holding facilities in the New York City area. Just beyond the ornamental cast-iron gates of the main entrance stands a flagpole and the superintendent’s lodge. Quartermaster General Montgomery C. Meigs designed the lodge in 1887. The Cypress Hills lodge was rendered in the Queen Anne Victorian-style with an L-shaped floor plan with multiple gables. This lodge varies from Meig’s standard Second Empire-style design. The two-story brick building was expanded in 1933 with a one-story addition containing office, garage and storage space, and restrooms for cemetery visitors. In 1938, a brick-and-concrete utility building was constructed east of the lodge. A driveway leads from the superintendent’s lodge to a Classical Revival rostrum on the north side of the cemetery. Built in 1939, the rostrum is of limestone construction with a clay tile roof. Three commemorative monuments are located in the cemetery. 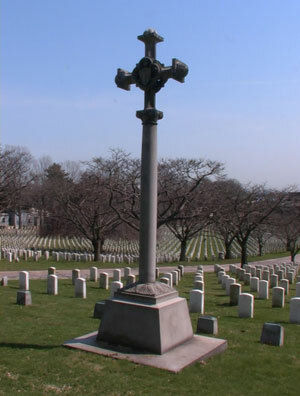 A granite French cross honors 25 French sailors who died when their ammunition ship blew up in New York Harbor in 1918. A second monument, erected by an American Legion Post in 1945, commemorates those who died while serving in the Second Division of the American Expeditionary Forces. The third monument bears the name of 14 officers and sailors of the British Navy, who died in 1783 off the coast of New Jersey. Originally interred at New Jersey’s Fort Hancock, the sailors were reinterred at Cypress Hills National Cemetery in 1909. Within the Union Grounds is a granite obelisk that commemorates the service and bravery of Union Colonel Benjamin Ringgold of the New York Volunteers 103rd Regiment. The 35-year-old officer died in battle near Suffolk, Virginia. Many of the burials at the Mount of Victory plot are veterans from the War of 1812. The last surviving veteran from the war, Herman Cronk, was interred in this section upon his death in 1905 at the age of 105. A monument of field stones arranged in a pyramid and crowned with a statue of an eagle was built in the mid-1930s as a memorial to those who fought in the War of 1812. Cypress Hills National Cemetery is the final resting place for Medal of Honor recipients, the nation's highest military decoration, given for "conspicuous gallantry and intrepidity at the risk of his life above and beyond the call of duty." 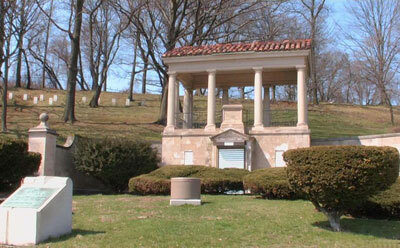 Cypress Hills National Cemetery is located at 625 Jamaica Ave. in Brooklyn, NY. The cemetery is open for visitation daily from 8:00am to 4:30pm. No cemetery staff is present onsite. The administrative office is located at the Long Island National Cemetery, and the office is open Monday to Friday from 8:00am to 4:30pm; the office is closed on all Federal holidays except for Memorial Day and Veterans Day. For more information, please contact the cemetery offices at 631-454-4949, or see the Department of Veterans Affairs website. While visiting, please be mindful that our national cemeteries are hallowed ground. Be respectful to all of our nation’s fallen soldiers and their families. Additional cemetery policies may be posted on site. The Union Grounds and the Mount of Victory plot are located within the private Cypress Hills Cemetery, located at 833 Jamaica Ave. in Brooklyn. The private cemetery has a number of notable burials, including artist Piet Mondrian, baseball player Jackie Robinson, and actress Mae West. Cypress Hills National Cemetery was photographed to the standards established by the National Park Service’s Historic American Landscapes Survey.